Option E Neurobiology - Welcome to The Frog Pad! E.1.1 Define the terms stimulus, response and reflex in the context of animal behaviour. 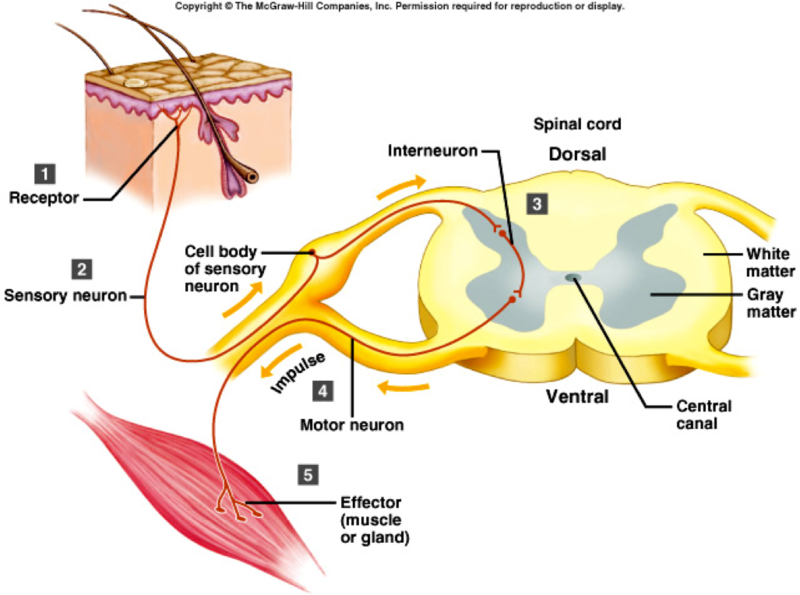 E.1.2 Explain the role of receptors, sensory neurons, relay neurons, motor neurons, synapses and effectors in the response of animals to stimuli. E.1.3 Draw and label a diagram of a reflex arc for a pain withdrawal reflex, including the spinal cord and its spinal nerves, the receptor cell, sensory neuron, relay neuron, motor neuron and effector. E.1.4 Explain how animal responses can be affected by natural selection, using two examples. The Central European blackcap spends its summers in Germany and Austria and, until the 1960s, had spent its winters in balmy Spain. About 50 years ago, however, backyard bird feeding became popular in Britain. E.2.1 Outline the diversity of stimuli that can be detected by human sensory receptors, including mechanoreceptors, chemoreceptors, thermoreceptors and photoreceptors. 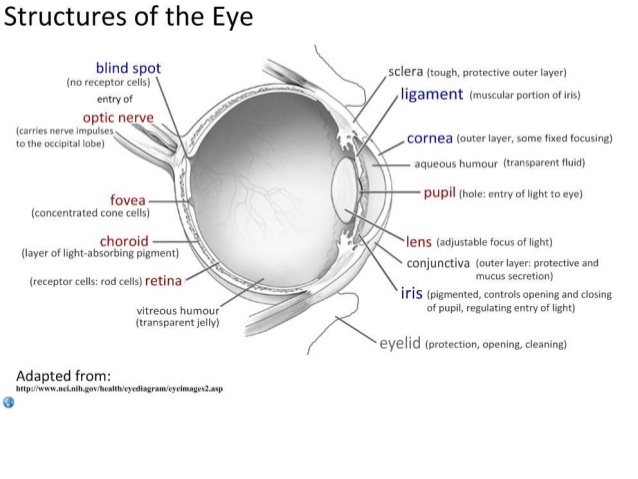 E.2.2 Label a diagram of the structure of the human eye. 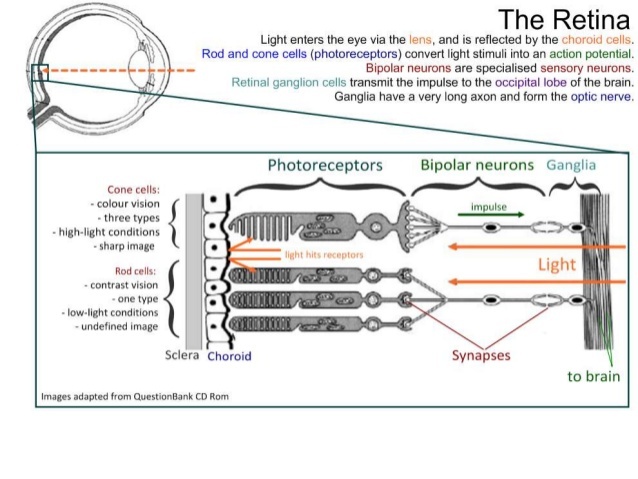 E.2.3 Annotate a diagram of the retina to show the cell types and the direction in which light moves. E.2.4 Compare rod and cone cells. 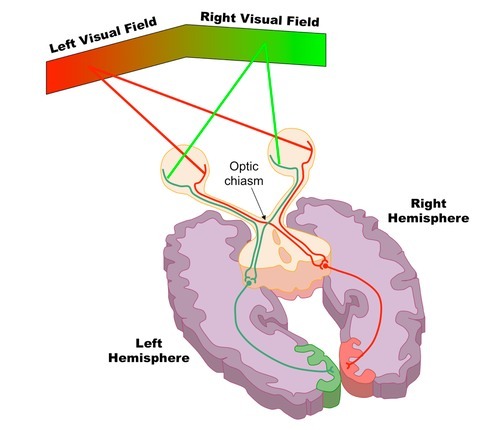 E.2.5 Explain the processing of visual stimuli, including edge enhancement and contralateral processing. See YouTube videos to the right. E.2.6 Label a diagram of the ear. 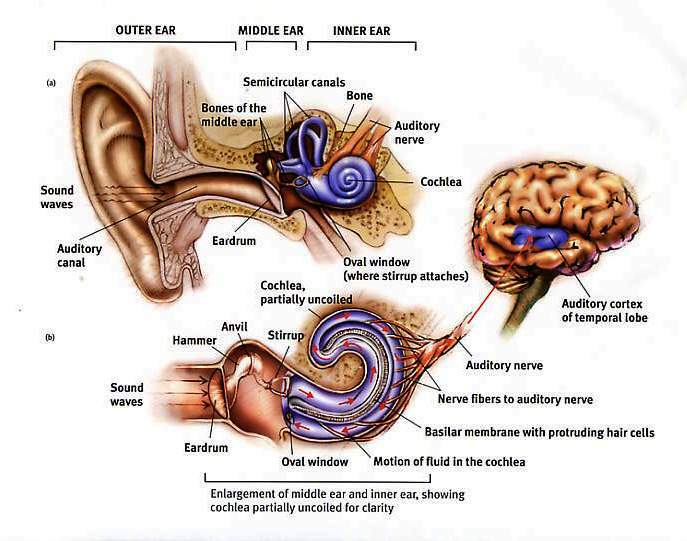 E.2.7 Explain how sound is perceived by the ear, including the roles of the eardrum, bones of the middle ear, oval and round windows, and the hair cells of the cochlea. Use IB Bio Help.com (click here) for an interactive diagram of the ear and the functions of each part. How the parts of the ear works. Cool 3D animation of how the ear works. It's a bit in depth than you need to know for IB assessments, but very interesting. E.3.1 Distinguish between innate and learned behaviour. E.3.2 Design experiments to investigate innate behaviour in invertebrates, including either a taxis or a kinesis. E.3.3 Analyse data from invertebrate behaviour experiments in terms of the effect on chances of survival and reproduction. E.3.4 Discuss how the process of learning can improve the chance of survival. E.3.5 Outline Pavlov’s experiments into conditioning of dogs. E.3.6 Outline the role of inheritance and learning in the development of birdsong in young birds. E.4.1 State that some presynaptic neurons excite postsynaptic transmission and others inhibit postsynaptic transmission. E.4.2 Explain how decision-making in the CNS can result from the interaction between the activities of excitatory and inhibitory presynaptic neurons at synapses. E.4.3 Explain how psychoactive drugs affect the brain and personality by either increasing or decreasing postsynaptic transmission. E.4.4 List three examples of excitatory and three examples of inhibitory psychoactive drugs. E.4.5 Explain the effects of THC and cocaine in terms of their action at synapses in the brain. E.5.5 Discuss the causes of addiction, including genetic predisposition, social factors and dopamine secretion. E.5.1 Label, on a diagram of the brain, the medulla oblongata, cerebellum, hypothalamus, pituitary gland and cerebral hemispheres. E.5.2 Outline the functions of each of the parts of the brain listed in E.5.1. E.5.3 Explain how animal experiments, lesions and FMRI (functional magnetic resonance imaging) scanning can be used in the identification of the brain part involved in specific functions. E.5.4 Explain sympathetic and parasympathetic control of the heart rate, movements of the iris and flow of blood to the gut. 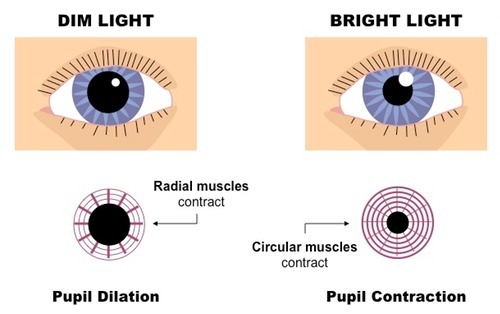 E.5.5 Explain the pupil reflex. E.5.6 Discuss the concept of brain death and the use of the pupil reflex in testing for this. E.5.7 Outline how pain is perceived and how endorphins can act as painkillers. This YouTube video discusses using fMRI for marketing research purposes (called neuromarketing!). It also has more in-depth information about the science of fMRIs. The second video is a 60-Minutes short video about fMRI and computers that may one day be able to read what you are thinking. It also touches upon neuromarketing.